Do you give violin lessons? Where can I find a suitable teacher? Finding Suzuki teachers in South Africa? How much should I pay for an instrument? Can I rent a violin from you? Can I pay off the violin over time? Can I trade in my violin against another one? Where can I have my instrument repaired? How much should I pay for repairs (& rehairs)? Where can I buy sheet music? Where can I buy an electric violin? This page is currently being written and is subject to alterations, additions and general editing, and will remain so for some time to come. However, information currently on it, below, is valid. This question also involves labels of Amati, Guarnerius, Maggini, Ruggieri, Bergonzi and many other high profile makers whose labels are routinely faked and put into cheap trade (factory) instruments. I receive a constant stream of emails and phone calls from persons who have found an instrument with a Stradivarius label in it. They always ask the same questions: Is it real? How can they tell if it is authentic? And the favorite - What’s it worth? About 99.9 % of instruments with a Stradivarius label inside (or any such high-profile name) are “trade” (factory) instruments - they are produced in large studios or factories and are aimed at the student and amateur market. These labels simply mean that the instrument is based on the model of that maker. They do not claim that the instrument is his work and are sold with the understanding that it is not authentic. 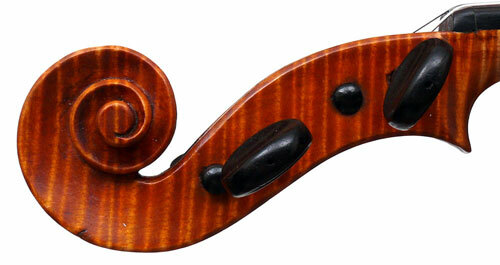 There are many such instruments in circulation with other versions of Stradivari’s labels. These instruments have nothing to do with Stradivari. Most of the prices on this site are in the South African currency, the Rand (ZAR) expressed as an 'R' in front of the amount. These instruments (including a large number of violas, cellos and child instruments), emerge all over South Africa. I see many of them and have assisted people in selling them. J J van de Geest’s personal output as violinmaker and his later contribution to the music life in South Africa is impressive: After completing his apprenticeship as violinmaker in Holland under the great master, Eberle, Jacobus Jan van de Geest (1899 – 1974) was for 18 years Master Craftsman and Chef d’atelier for London’s most important violin company – Hart & Son, under George Hart. Here he was in charge of assessments of and repairs to the world’s finest instruments. In London (and in fact in all of England and elsewhere) he established a reputation for supreme expertise and craftsmanship that stood him to credit for the rest of his life. When Hart & Son closed down in 1938, Van de Geest emigrated from London to Johannesburg, where he became the most important single force in South Africa’s violin world. He maintained his privileged relations with European experts and continued importing some of the finest violins available in Europe to his shop in Johannesburg. Many fabulous Cremonese and other instruments of great master violinmakers of the past made their way to South Africa through J J van de Geest’s work. Since all violins are handmade to more or lesser degree, including factory instruments, the question is rather, Is my violin a Trade (factory) violin or a fine violin? This question is answered in detail in the page PRICE STRUCTURE under the sub-heading “About Trade and Fine Instruments”. See the menu bar above. No, not at this stage. I travel a lot and having violin students would mean giving them their lessons regularly every week. Contact me and let me know where you live. I have a comprehensive database and if I have information available, I will let you know who to contact. You can also contact the SASMT (South African Society of Music Teachers): Go to their site at http://www.sasmt-savmo.org.za. Click on “Members” and then click on “Find a Teacher”. You can also write to Elma Britz (SASMT Executive Officer) on e-mail: britz@lantic.net. There is a very strong Suzuki presence and activity in South Africa with several excellent teachers in various centres. You can direct all enquiries by email to suzuki.association.sa@gmail.com. The activities are co-coordinated by Anne Naylor and you can contact her directly at anaylor3@gmail.com, or to call her on 072 2031515. You can also contact Andrea Kreuiter in Pretoria on 079 5195659. She is a Suzuki teacher and could give you information. Leoni Marais in the Gauteng is also a well-established Suzuki teacher. She can be reached on 0834569912. In the Durban area you can contact Louise Howell on 082 4032514. If you want to buy the Suzuki Method books and other publications for various instruments, they are imported and stocked by Lovemore Music Centre. Contact their head office at the Melville branch on 011 8372943. You can contact The Instrument Library in Johannesburg on 011 8372685. It is run by Dan Zack - his cel number is 082 8516510. They rent out all sorts of instruments to persons all over the country, including violins, violas and cellos. They are situated at 97 Caroline Street in Brixton. Furthermore, Lovemore Music Centre in Johannesburg has a very effective Music Instrument Rental Division. Contact the Brixton brance of Lovemore on 011 8372943. You can also contact Svend Christensen in Johannesburg. Svend studied bow making in France and has a violin and bow making studio in downtown Johannesburg. He rents out string instruments all over South Africa. Interestingly, he also rents out advanced instruments, other than beginners instruments. You can send him email on svenizm@gmail.com or phone him on 082 7696343. See the page FOR BUYERS for a detailed answer. No, you can’t. For a more complete answer see the page FOR BUYERS. This is answered in detail in the page PRICE STRUCURES. I have comprehensive database of qualified, reputable and experienced violinmakers and craftsmen in different parts of South Africa who can do repairs to violins, violas, cellos and bows (and double basses) through the correct traditional methods. If you need a repair done, please contact me directly by email and I will direct you to someone in your area who could carry such repairs. Be aware that there are individuals throughout the country who routinely carry out work on stringed instruments, who by all standards are not qualified to do so, who do not use traditional methods and who routinely damage instruments permanently, leaving them with virtually no resale value. I encounter their devastation on a regular basis, and often have the unfortunate task of telling the owners that their instruments have no further commercial value. Please go to the trouble to find a qualified craftsman! As much as anyone in a free market system may charge whatever he likes for his services, the reality is that there are norms within the violin world that most reputable repairmen adhere to. Unfortunately some individuals have exploited their clients' ignorance about repairs and the normal associated costs, and are simply ripping them off. I'm currently putting together a pricing guide for repairs to stringed instruments and bows as are normally charged within South Africa, and I'm doing so in association with South Africa's foremost violinmakers and with the most reputable and qualified craftsmen. I hope to publish it here as soon as it is ready, and hope that it will protect our musicians from exploitation, empowering them to seek out those craftsmen who respect the norms. In the mean time, if you have doubts about the fairness or validity of a quote, please contact me and will advise as best I can. Lovemore Music Centre in Johannesburg imports just about any printed music you can think of for violin, viola and cello (and for just about any other instrument) - from the established standard classical and serious music repertoire, to light music arrangements. They also keep the latest international examination syllabuses and books for the most important music exam systems in the world. It is really impressive. They have almost always had in stock what I wanted, and when they didn't, they ordered it for me and I received it within a reasonable period of time. Furthermore, they have in place an effective mail delivering system for teachers and musicians all over South Africa and elsewhere. The person in charge of Lovemore's sheet music stock is Louise Fram-Arp at the Brixton branch on 011 8372943. Contact Lovemore centres in Brixton on 011 8372943, in Boksburg on 011 8236267/8, in Illovo (that's near Sandton) on 011 2680150, and in Irene (Pretoria) on 012 6652029. In Durban, for a fairly impressive supply of sheet music, contact Music Inc. on 031 5726651. They are on the top floor of La Lucia Mall. One of the most extraordinay designers of instruments (including the most fabulous electric violins and guitars) is Murray Kuun, in Johannesburg. You can see some of his work and read more about him here: Murray Kuun, which includes his contact details. Also, Lovemore Music Centre in Johannesburg imports some really good and attractive electric violins and distributes them to various retail outlets in South Africa. Phone them in Brixton on 011 8372943, in Boksburg on 011 8236267/8, in Illovo (that's near Sandton) on 011 2680150, and in Irene (Pretoria) on 012 6652029. SANYO is the South African National Youth Orchestra. The chairperson of the Communications Committee is Sophia Welz, on +27 (0) 82 878 4978. The email address is comcom@sanyo.org.za. To start with, have a look at this website: www.standing-ovations.co.za. They specialize in supplying musicians and entertainers for special events and have a database of excellent violinists. Follow the links to “Wedding Violinists”. You can also e-mail them directly on bookings@standing-ovations.co.za. Furthermore, if you are a musician wishing to register on that website to play on weddings, simply go the site and register. It really works well.. In the Gauteng area: try this site: www.theweddingviolinist.co.za. If you are in Durban or the greater KZN area: Boris and Elena Kerimova are the string players of the acclaimed Kerimov Trio. They have a new website (highly recommendable!) which offers an impressive range of combinations and styles for performance at functions. Apart from performing themselves, they can arrange for any number of musicians to participate. Check out the site here: www.bravomusic.co.za. You can also phone them directly on 084 9522160 and 031 5611172. They are excellent performers who regularly broadcast on 'Classic FM'. The all-women Quattro Femmes String Quartet is also available. Contact Nina Watson on 082 8771793. You can also try these musicians: www.weddingstringquartet.co.za You can email them on allegro@saol.com, or phone Kolio Kolev on 083 5552602 or at home on 031 2666892. Also in Durban: phone Hristo Kardjiev on 031 2011175 and 072 2478228. Hristo is Concert Master of the KZN Philharmonic Orchestra. In the Cape Town area:: The Hungarian Trio is a real class act specializing in functions and weddings. Their site is: http://www.hungariantrio.co.za You can also contact them through Gabor Jeney on 021 7945759 or 082 4562458, or by email on jeney@iafrica.com. If you don’t get sorted there, please contact me directly.